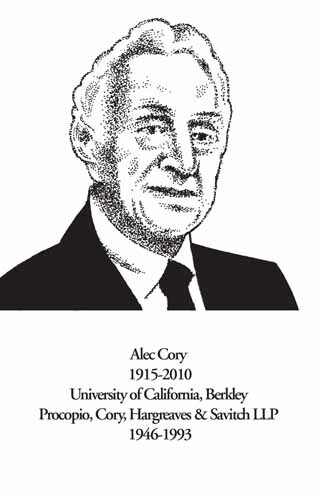 Alec Cory was a founding partner of Procopio, Cory, Hargreaves & Savitch LLP where he promoted a culture of respect and fairness through example. His legal ability, philanthropy and advocacy of pro bono work garnered him many awards over the years including the San Diego County Bar Foundation’s Inaugural Fellow recognizing his outstanding legal ability and devotion to the welfare of the community. Born as one of six children in Gallup, New Mexico, Mr. Cory grew up in Oceanside. He served in the Navy during World War II and then returned to San Diego where he opened a law practice with Edward Schwartz. The partnership’s first office was at Sixth and Broadway and consisted of two cubicles separated by a partition and 300 square feet of space. Today, the firm is a full-service business law firm with more than 100 attorneys in San Diego and Carlsbad and offices that take up five floors of a downtown building. Equal access to justice was one of his passions. He played a key role in developing and supporting the San Diego Volunteer Lawyer Program. As an advocate of legal aid for the needy, Mr. Cory carried great weight in the community. He funded scholarships for students pursuing careers in public interest law and supported Procopio’s involvement in charitable and educational endeavors, including the American Diabetes Association and Fondo para La Paz, a microloan program helping families in rural Mexican villages. His commitment to his community and his profession extended to being a member of the Senior Advisory Board for the 9th Circuit Court of Appeals and being on the state college system’s board of trustees in the 1960’s and 70’s as well as serving as president of the San Diego County Bar Association in 1966. Mr. Cory’s legacy is carried on through the tremendous commitment to pro bono work and access to justice that exists in the over 40 public interest and legal aid organizations supported by the San Diego County Bar Foundation.